Waiting for a faculty job offer? This seminar will introduce you to the negotiation process and what items can be negotiated. 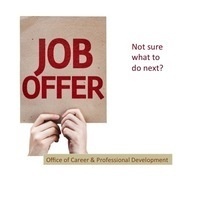 What are the components of a faculty job offer? How are faculty salaries structured? How detailed should your start-up budget be? What non-salary items can be discussed? What strategies and language can I use to negotiate? What next? Start Developing your negotiation strategy at this follow-up workshop.